Your best defense against illness is a healthy immune system. Stress, lack of rest, and poor diet all contribute to reducing the strength of your immune system and weakening your body's response. Unfortunately, we often don't think about bolstering our immune response until it's too late. 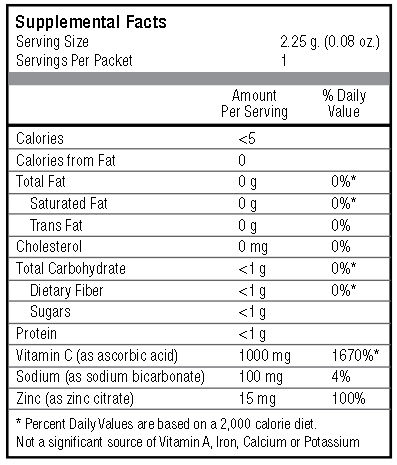 Contains no added sugars and no artificial sweeteners, flavors or colors. Is a powerful antioxidant found in foods like blueberries, red apples, grapes and red onions. It naturally stimulates the body's ability to produce more energy and is a natural anti-histamine and anti-inflammatory agent. The health benefits of pinecone extract were first documented in 500 A.D. by the Greeks. Since that time, the extract has been used in modern day Japan where it has long been associated with an increase in health and longevity. Pinecone extract is an all-natural botanical compound with anti-bacterial and anti-inflammatory properties and it acts to bolster the immune system by promoting dendritic cell development. These mature dendritic cells stimulate super-fighter T-cells which your body uses to protect the immune system by responding to bacteria and foreign invaders. Used for centuries by the Japanese as an herbal remedy, Black Currant (Cassis) is known as the King of Berries and has long been recognized as being one of the most health-promoting fruits in the world. Locked inside this super fruit are illness-fighting components including anthocyanins, antioxidants, and essential fatty acids Omega-3 and Omega-6. Black Currant berries are also packed with Vitamin Bs, Vitamin C, Vitamin A, calcium, magnesium, beta carotene, dietary fiber, and tons of other helpful vitamins and nutrients. 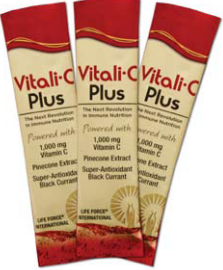 Life Force has carefully chosen the origin of the Black Currant used in Vitali-C Plus in order to optimize health benefits, flavor and color. Grown in an ideal climate in New Zealand, our Black Currant benefits from the country's pure mountain waters and uncontaminated, fertile soils. New Zealand Black Currant scores more than twice as high as blueberries, and six times higher than red grapes in ORAC testing; evidence of the magnificent antioxidant properties of the Black Currant grown in this region. A water-soluble vitamin necessary for normal growth and development. Because it is water-soluble, the body is unable to store this essential vitamin, so it must be consumed daily. Vitamin C is an anti-oxidant that can help fight free radicals, increase the absorption of iron, and helps to produce collagen. 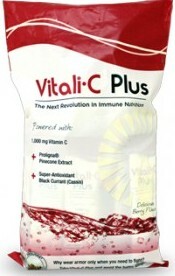 Vitamin C boosts your immune system and increases white blood cell production as well. It even aids the repairing and maintaining healthy cartilage, bones and teeth. Life Force has a long history with Vitamin C. Dr. William Saccoman led our Nutritional Advisory Board for many years and he worked closely with Nobel Prize recipient Linus Pauling who is known as the "Father of Vitamin C". Pauling's research shows that Vitamin C is a powerful defense support for the body. Is an essential mineral that is vital for growth and development. It is also instrumental in immune response, neurological function and reproduction. Unfortunately, over 25 percent of the world population is at risk of zinc deficiency, leaving millions of people susceptible to a variety of infectious agents. Zinc supplementation can correct adverse alterations in immunity in individuals with low levels of this mineral. Is crucial for absorbing and metabolizing calcium and phosphorous, which are especially important in the maintenance of healthy bones. Without sufficient vitamin D, bones can become thin, brittle, or misshapen. While it can be obtained through sunlight exposure and diet, very few foods naturally contain enough vitamin D, which is why supplementation is a great way to ensure you get the amounts your body needs. Is a compound that is naturally present in the body. It is made of glucose and glutamine, an amino acid. Glucosamine is necessary to create a molecule called glycosaminoglycan, which is used to repair tissues and cartilage. As we age, production of glucosamine slows, and we require supplementation. FlexeoPlus, OsteoProCare and OsteOmegaCare contain glucosamine. The glucosamine used in OsteOmegaCare is a vegetarian source. Is a naturally occurring compound that plays a vital role in the resiliency of cartilage. Supplementation with chondroitin may increase the of the formation of new cartilage, improving the symptoms associated with osteoarthritis. Is a mineral that helps keep bones and teeth strong, in addition to helping the heart to beat and the muscles to contract. Calcium is essential for overall wellness, and it must come from dietary sources, including dairy, soy products, dark green vegetables, beans, and calcium-fortified supplements, such as OsteOmegaCare and OsteoProCare. Is an essential mineral for human nutrition. It is necessary in the formation of bones and teeth and assists with absorption of calcium and potassium. It helps muscles contract and relax, while producing and transporting energy within the body. According to a study published in the journal, Neuron, the nutritional supplement magnesium can help boost an individualâ€™s brain power by enhancing short and long-term memory as well as the ability to learn.